Ever since it opened in 1920, this stadium was among north-western USA’s most important. Presidential speeches, academic tournaments and ceremonies, even NFL games and various other guest events. All this took place at Husky Stadium, one of not too many stadiums for American football that also had a running track. 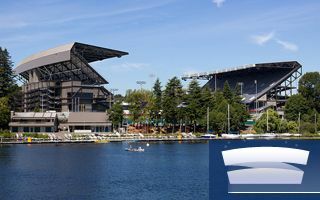 The athletic layout of lower tier seating was among the reasons for redevelopment, though the structure’s deteriorating state was more important in encouraging University of Washington to make its biggest investment ever. Priced at over $260 million, this revamp was thought through by world-famous 360 Architecture. Except 360 weren’t given a similar task they encountered in many other locations worldwide, where investors are asking for innovative, futuristic stadia. Here the aim was to recreate the stadium with respect to its historical layout and at the same time provide world-class amenities that will last decades. This is why the stadium by Lake Washington waterfront wasn’t rotated and retained its traditional setting. Only a small stand was built in the east, making sure that most fans are still able to enjoy the great view from their seats. The largest piece of the old stadium was the northern upper terrace, erected in 1987. Underneath it completely new stands were built with new corporate section . Likewise, the south side received a brand new structure with room for skyboxes and other kinds of premium seating to ensure the university increases the revenue stream and ensures safe future for the NCAA team Huskies. After over two years the stadium may still look very similar to the old structure, if you haven’t known it well beforehand. The overall blueprint still resembles a horseshoe, though the running track was dropped and west curve is only slightly curved now. There are still two large covered terraces opposing one-another and clearly dominating the skyline. Aesthetics is a matter of taste, as always. This stadium is a real giant, one many NCAA enthusiasts know very well. On one hand it’s stripped to raw, bare steel trusses in some parts, but on the other there are attractive and decorative walls surrounding the west side as well, adding to its charm and making it fit more into the University of Washington campus. It's surely huge, but did it make a huge impression on you? Show it by voting for Stadium of the Year 2013!